Being around this group of weirdos and nut cases (all y'all), you quickly learn not just what someone collects, but their tendencies. So when that person mails you something, you have a pretty good idea what's going to be inside after the 4th or 5th time their address is in the upper left corner. It could be a boat load of commons, junk wax, set filler or odd balls, but that never takes away from the fact that the person thought enough to gift you with cardboard. So when I received a manila mailer with the familiar location of Matt from Bob Walk The Plank, I was fairly certain there would be a hit or two within the envelope. 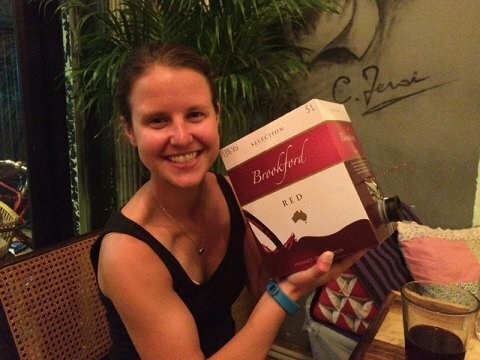 Matt is a gracious duplicate of JBF Wes and always seems to find relics or autographs to send to Casa 2x3. How was I to know the mailing was nothing BUT relics and autographs. It's sad that Alexei will not be in the six hole come 2016. In fact, there is no interleague game between the Padres and Sox, so the only place to catch him in Chicago will be Wrigley (pass). 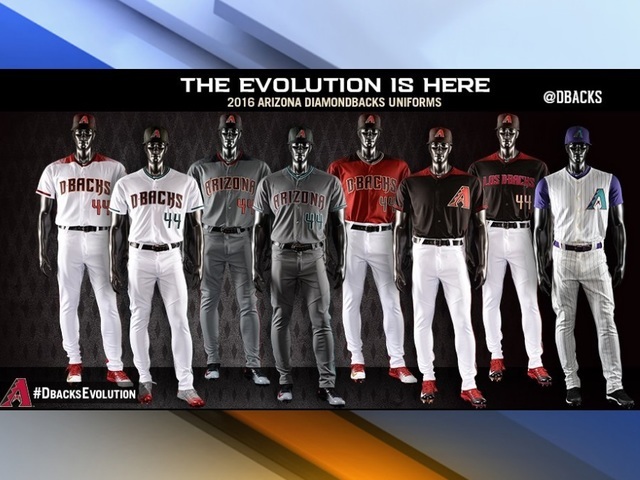 Reed is doing well out is Arizona, but I have pity on him considering the..... things....the D-Backs will sport this coming season. Lastly is a relic from Kenny's half season stop on the south side. I'm doubting that particular bat was held while wearing black. 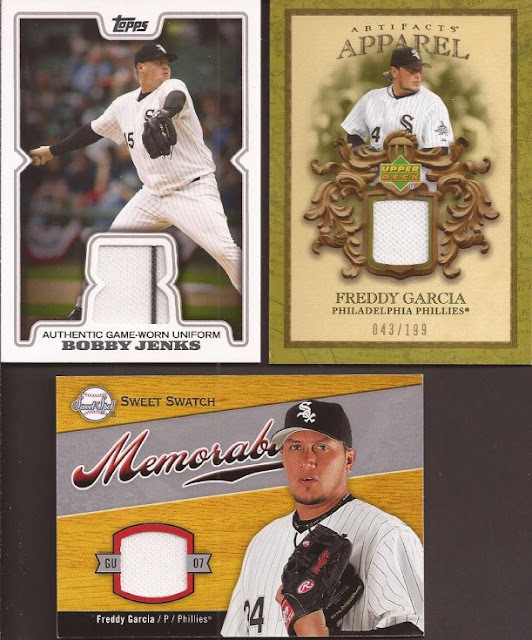 You can see both the Garcia cards list him as a Philly, but you and I, and Matt, know those are White Sox swatches, and I will gladly put them in my collection. Freddy was solid during the 2005 and 2006 seasons for the Pale Hose. Jenks straight up scared the hell out of batters during 2005. These two oddballs are just that - odd. As nice and low numbered as the Buehrle is, the swatch is blue and you can see the material. My guess is this is from a warm up top, but the Sox never wore blue warm ups during Mark's time. Luckily, the back tells us this is from an All Star event, so that would make this a piece of this uniform top. The Ordonez? 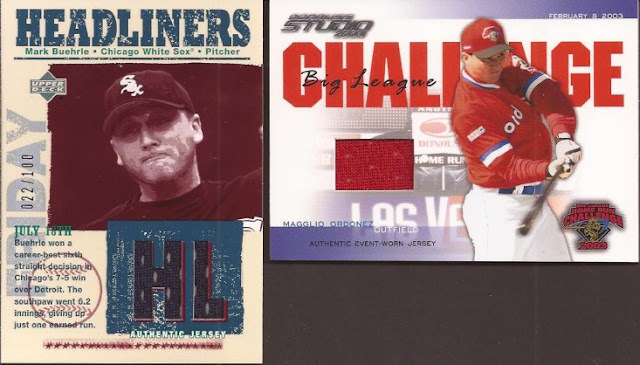 From a contest I never knew about - Big League Challenge. Basically, the Home Run Derby. But you see the uniforms had the player's name on the front. 90's - amirite? What? It was from 2001-2003? Ok.
Fine - I just become a Sale collector. :) Actually, no I won't, but I do like getting cards of Chris, and I really like the autos. Santos never panned out in the Cell. He's currently in the Bronx. Davidson - we'll see where he ends up with the signing of Lawrie and Frazier. So I thought 1 or 2, I got 11. Totally not what I expected. Thanks Matt. Alexei has been my favorite Southsider for a while now, so I was sad to see him move on myself. Of course, his production dictated that, but it's always sad to see a sentimental favorite move on. That Bob Walk guy is nuts! 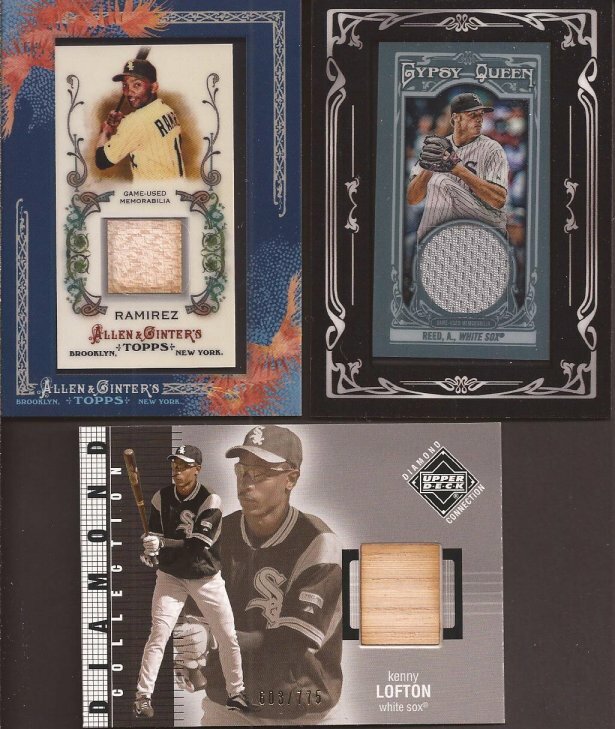 I think that officially cleaned out the White Sox hits. Looking forward to finding some Todd Frazier cards for you! I still can't believe how affordable Chris Sale is. He is arguably a top 3 pitcher in the whole league.